Jacques Callot, born in Nancy France, was a French engraver, etcher and draughtsman. He learnt the technique of engraving in Rome and in 1612 was employed at the court of Medici family in Florence. He was mainly employed to make pictorial records of the pageants and festivals of the time. He had an eye for caricature and the grotesque, but also drew sketches of the noble and proud. His output was prolific and he produced thousands of etchings and drawings. Callot’s etchings of The Miseries and Sufferings of War are among the best known prints published in seventeenth-century France. His work is exhibited throughout Europe and the US and lives on in the Major auction houses. Some drawings can fetch tens of thousands. This graphite drawing is more unusual as it depicts a rather proud cavalier. The paper has been tested by a paper restorer in Dublin and is of the period. An etching of the Cavalier with a small boy to his right hand is catalogued in a book of Callot’s etchings. 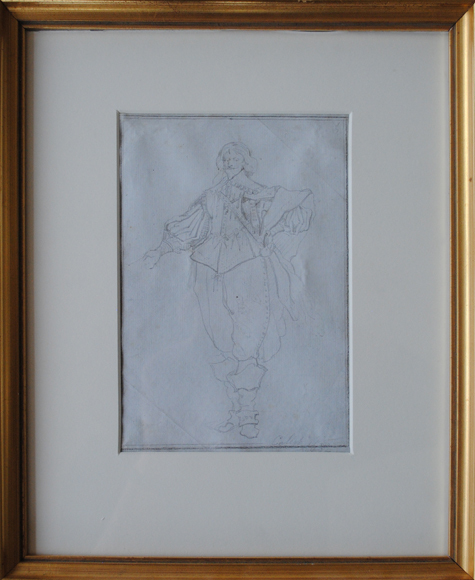 This is believed to be a sketch he prepared for the etching. It was once the property of Alfred Elmore a Royal Academy artist. From the collection of Alfred Elmore R.A.